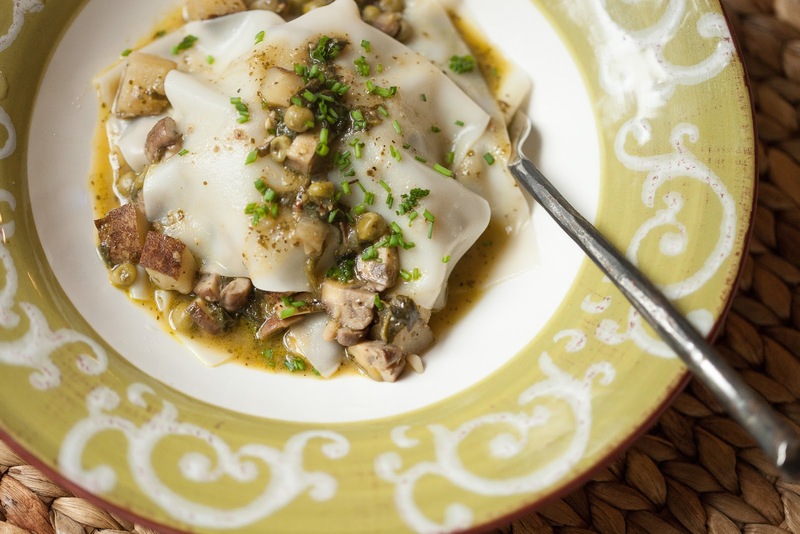 This ravioli dish is not what one might consider refined. If described as a person, I'd say it's more of a carefree, laid back, jovial ravioli... maybe one with a few extra pounds and a button popped off its britches. It has all the flavor of a good, put-together ravioli... only a bit heartier, given its unstructured state. And like what some may consider "peasant" food, it incorporates fresh, inexpensive, flavorful ingredients in a fuss-free plating that comes together super quick and easy. I've only made ravioli from scratch... as in rolling your own pasta... a handful of times. It's definitely good but not a quick, go-to option for an everyday type of meal... personally speaking. If I'm looking to make a quick ravioli I tend to turn to wonton wrappers. They work just great... no mixing, kneading or rolling required. When I mentioned this to my daughters, I got the impression that even the little time required to fill, seal and boil wonton wrapper-style ravioli might be more than either would be willing to take on midweek at 7 o'clock in the evening... when you no longer want to think and your stomach is grumbling. So... enter the deconstructed ravioli. This is certainly not a new idea... just one I had to clear some mental cobwebs to recall. 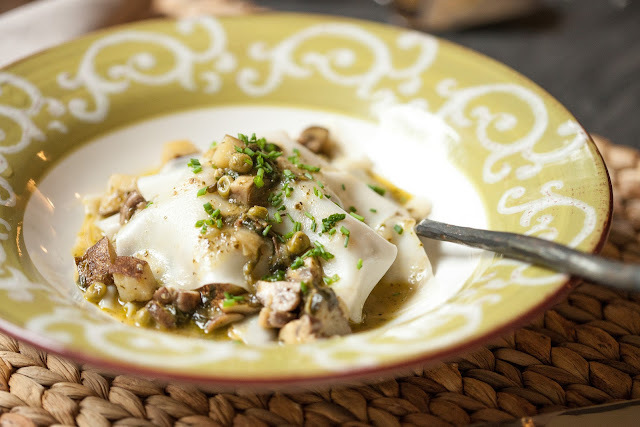 The best thing about this type of ravioli option is it's super quick (and yummy). 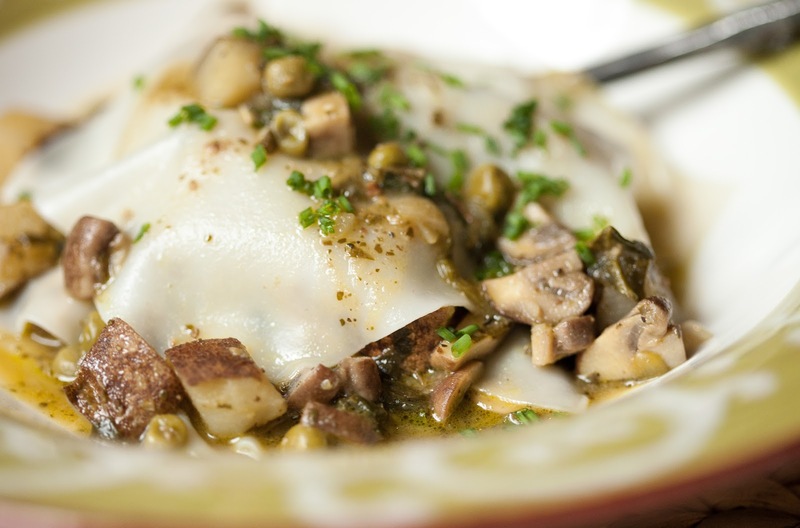 It delivers the same satisfaction as filled ravioli (the wonton wrapper variety!)... only better. You still have all that silky, barely-there pasta. Only plated in this manner, you get a far more generous dose of filling. 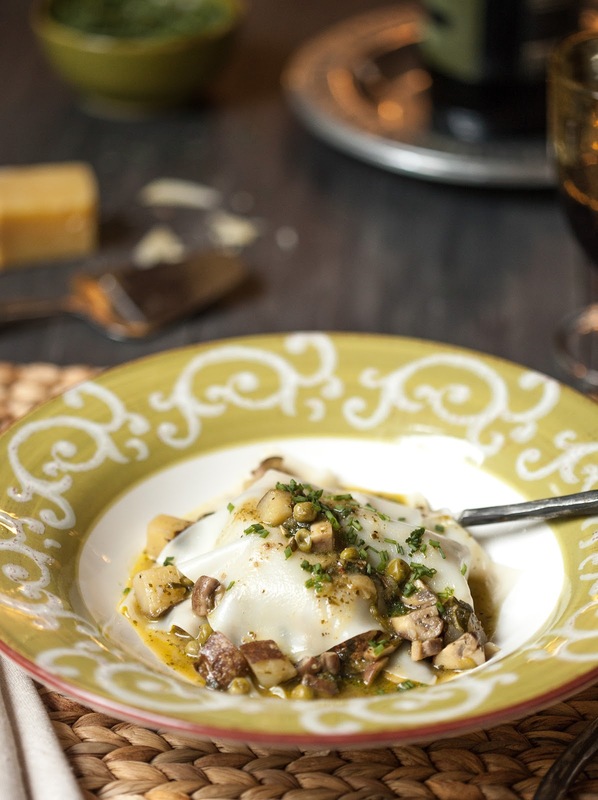 This quick, peasant-style plating of ravioli allows you to amp up the filling a bit. In addition to mushrooms and spinach, I added potatoes, peas, pesto, parsley, herbes de provence, a little broth, and a good pop of fresh lemon juice. You can really do just about anything you want with your "filling" without the same consistency concerns you might have with a filled ravioli. If you want to soup it up, add more broth. If you want to veggie it up, toss in carrots, or zucchini... whatever sounds good. It can go soup-y or stew-like... or it can pull itself together and be a filled ravioli, seams sealed and all buttoned-up... if that's your thing. Some of the seasonings are noted as divided as I think it's best to layer them in, to taste, as ingredients are added. Heat 1 tablespoon olive oil in a large skillet over medium heat. Add shallots and cook for 1 to 2 minutes. Add potatoes and continue cooking for 8 to 10 minutes, until potatoes are just able to be easily pierced with a fork, but not completely tender (lower heat, if necessary, to prevent burning); toss intermittently to ensure even cooking and season with 1/2 teaspoon kosher salt and 1/2 teaspoon ground black pepper. Add another tablespoon of olive oil to potato mixture, along with mushrooms and garlic. Toss well and continue cooking until mushrooms are tender, about 5 minutes. Season with remaining 1/4 teaspoon kosher salt and 1/4 teaspoon ground black pepper, to taste. Add frozen peas to skillet, along with spinach, herbes de provence, parsley, and broth. Simmer for approximately 15 to 20 minutes, until potatoes are fork tender and peas have warmed through. Add lemon juice and pesto, continue cooking until warmed through. Add additional pesto, lemon juice, salt and/or pepper, to taste. While "filling" simmers, heat a pot of water to boil. Add a good pinch of salt and a drizzle of olive oil to water. Drop 4 to 6 wrappers into boiling water at a time, stir gently to prevent sticking. Cook wrappers for 1 to 2 minutes, until silky and pliable (single sheets of pasta will cook through much quicker than a filled ravioli... estimate 1/2 time). Remove wrappers to parchment-lined cookie sheet (it's okay to be watery), or begin plating (using a spatula to transfer to plates is helpful). To plate ravioli, ladle a tablespoon or so of filling into a bowl, top with 2 to 4 pasta squares, ladle 1/4-1/2 cup filling over top and repeat. Top with chopped chives, parsley and/or parmesan cheese. Serve immediately.